Dieter Fox thinks cobots, a portmanteau for “collaborative robots,” will be a fixture of our future. These bots will operate alongside people, acting as our coworkers, companions, and caretakers. Fox also thinks he knows how to ensure the company he works for, NVIDIA, is the one leading this new era in robotics — and it all starts with an Ikea kitchen. In November, NVIDIA opened a new AI Robotics Research Lab in Seattle and appointed Fox as its head. 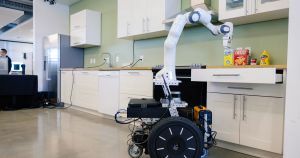 The lab already has about a dozen projects in the works, but the main one focuses on teaching a robotic arm to navigate an Ikea kitchen. For now, those tasks are limited to fetching items from counters and placing them in drawers. Eventually, though, the robot’s home economics curriculum could include everything from loading a dishwasher to cooking a meal. However, as cool as it would be to have a bot serve as your sous-chef, NVIDIA’s goal isn’t simply to prepare robots for life in the kitchen.